"Having worked together with Pierre Cousyn at the National Equitation School during the time he trained there, I can guarantee the great quality of our compatriot in all circumstances. His riding and teaching skills are well above the average. This perfectly educated man also appears to be worth the greatest trust." "I know Pierre to be a delightful person and a very credible rider and teacher. I have recommended him to individuals who have come to me for training help, and would do so again. 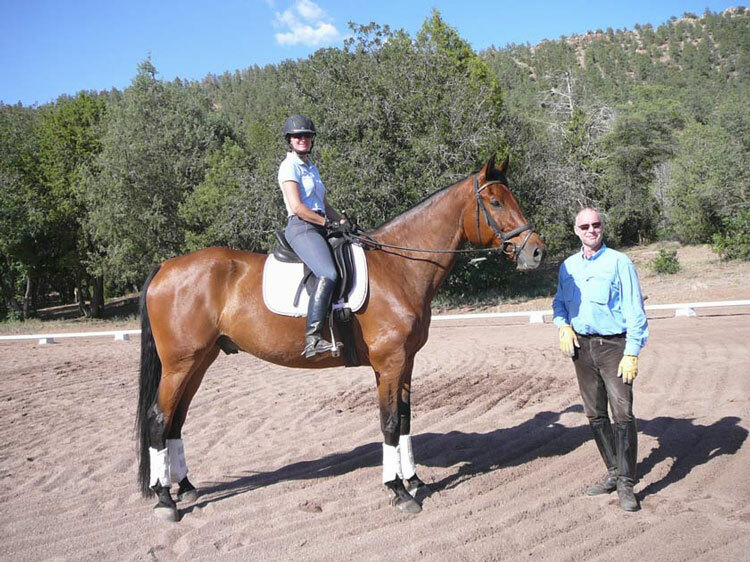 Pierre is qualified to ride both young and more advanced horses, and to teach students of all levels. He is known for his honest dealings with clients and is adept at evaluating prospective horses, and making suitable matches between horses and riders. I can recommend Pierre to train at your facility without reservations. I think you and your clients will be very well pleased with his services. A few months after I began training with Pierre, I mentioned to him that I was interested in getting a proven Grand Prix horse. I had a six-month old baby at the time, so I didn't have too much time to look for this horse; he also had to be extremely safe. Pierre was extremely efficient in his search. Within a few weeks, I had a video with several horses to choose from which all seem to be of quality to warrant a quick trip to Germany. In three days that I was there, we found my perfect dream horse, Kranak, not only a proven grand prix horse, but safe, sweet, beautiful and with a lot of talent. Pierre was a pleasant travel companion and all the business transactions were conducted in a fair and professional manner. I am very grateful to Pierre for finding me an excellent horse. Thanks to Pierre I have my dream horse! He is everything I've always hoped to find and more. His temperament, soundness, movement, and training are superb, and his pedigree and conformation are also world class. Top trainers from Europe and the US are equally impressed by this special stallion. I never thought I could afford a horse such as this, but thanks to Pierre he is mine. I have ridden and trained six of the horses Pierre has found and imported, and each of these horses has an extra special quality of movement, temperament and training. They really are unique. Pierre's customers are very satisfied and happy with their dream horses. This pleases me to no end because several of them have also been my training clients. I want them to be well and appropriately mounted and happy with their horses. I cannot recommend Pierre highly enough. Pierre is an experienced, talented horseman, and an extremely careful and thorough businessman. 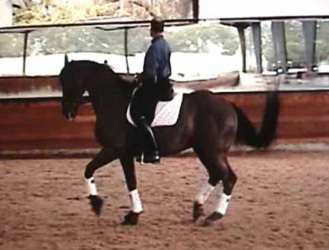 He has worked hard to make many excellent contacts for buying dressage horses. He has more than proven his ability to find outstanding horses that suit his clients' desires, needs and budgets. I have been to Europe on five horse buying trips with Pierre and have experienced first hand all aspects of his business practices and character. He is capable and extremely well organized. He is truly one in a million. He will find what you need and want, and help you select your dream horse, at the same time arranging for a positive, stress-free travel experience. With 25 years of teaching and training in Europe, and more recently for the past eight years doing the same in the USA, Pierre understands both the European and American horse markets. He was born and raised in France and is very comfortable traveling throughout Europe. This is an advantage for both his clients and his European horse buying contacts. American clients are definitely at an advantage in Europe when represented by a European, and the European breeders and dealers seem to be more comfortable negotiating with another European who shares cultural norms. Pierre has an incredible talent to quickly identify underlying causes for tension between the horse and rider and is able to explain solutions with an easy to understand "how" as well as "why", with both kindness and patience. The happiness of the horse is of the utmost priority and creates a new found harmony between the horse and rider, which makes everyday training a true joy. The focus is on relaxation, trust and correct training. His passion for the horses makes him a joy to watch ride and teach. So pleased fro you both. What a gift to have ability to follow a dream. I feel certain you will thrive in your new venture. Pierre I will sing praises of you to everyone always. You are the one and only Trainer I have ever work with who REALLY understands the horse. I looked forward to every lesson I learned at every lesson. You gave me tools that have made every ride with Caballero G. More correct and so enjoyable.What I value the most working with you. Is that you respected my work, in spite of its many wholes. You acknowledged my efforts and the connection between Caballero G. &Me . I thank you for that. It meant a lot coming from someone whom I believe is truly a Master Equestrain Master Trainer. Honored to have had the opportunity to work with you. Lia Giliotti & Caballero G.
Pierre Cousyn is a very special Coach and Trainer; and I put the two together because he teaches you to train your horse, and to think about your riding as an analysis of how to help your horse better understand what it is you are asking of him/her, and how to aide them through exercises both physical and mental; to progress through the most important foundation steps of REAL dressage - towards their best. He makes you a true horseman in every sense of the word; and never cheats or fools you or himself about what is really going on and how to best address it. I hope more Dressage friends and colleagues take the opportunity to avail themselves of his exceptional gifts, their horses will be thanking them for it. - Linda. My daughter has just taken her second clinic with Pierre Cousyn and I have to say that while I have had the great privilege of auditing may great clinicians - such as, Betsy Steiner, Steffan Peters, Ann Gibbons, Dolly Hannon, Hilda Gurney, Christine Traurig, Axel Steiner, Charlotte Bredahl-Baker and Kathleen Raines - this man brought something very different and refreshing to the table ... with the work Pierre did with his riders and their horses. There was a train of thought that I found encouraging and enticing... the concept of a horse being calm and comfortable in their work and how to actually go about accomplishing that. His big message was: don’t over react. Be specific, be firm, but no need to be abrupt. Calmness comes through quiet repetition. You can't force it, you can remove tension you can only work so that the horse comes to understand all is good with his world. The riders who participated were all incredible and came in all levels of experience. But at the end of their sessions, they all had calm, relaxed horses (and riders) who were both happy in their work and progress. Each rider left with new tools and goals and homework for his next visit. My daughter had three different horses in the clinic and I have to say, it was money well spent. He showed her how to properly work them on the ground impressing on her that her time with them on the lunge was actually a dressage lesson for them and that the obedience she develops there will carry through on their backs. He is out of Florida but comes to Arizona several times a year.